Nigeria’s 2015 election has been widely regarded as marking a milestone in the country’s democratic transition. For the first time, an incumbent president lost a bid for reelection. Goodluck Jonathan, the outgoing leader, conceded defeat readily, graciously passing power to his challenger Muhammadu Buhari, who he had trounced in the 2011 election. 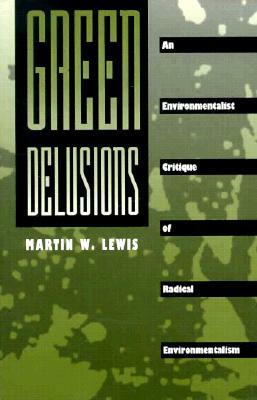 Buhari had been a repressive military ruler of Nigeria in the early 1980s, but he now regards himself as a “converted democrat.” Many observers credit Buhari’s victory to the belief among many Nigerians that a northern Muslim with a military background can deal more effectively with the Boko Haram Islamist insurgency than a southern Christian with a civilian background, such as the militarily ineffectual Jonathan. Many also think that Buhari’s somewhat abstemious personal habits will give him an edge in tackling the country’s massive corruption problems. As the first two maps posted here show, Nigeria’s 2015 election saw a significant reduction in county’s north/south regional/religious electoral divide. In 2011, every northern, Muslim-dominated state voted for Buhari, many by an overwhelming majority, whereas almost every southern, Christian-dominated state voted for Jonathan, many by an overwhelming majority. 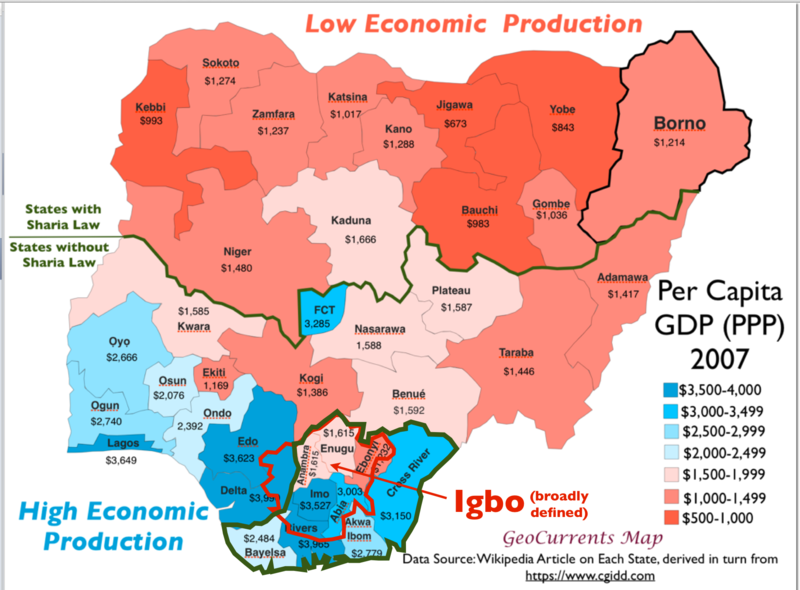 In the 2015 election, however, a number of southern states favored Buhari, including the country’s economic core of Lagos. 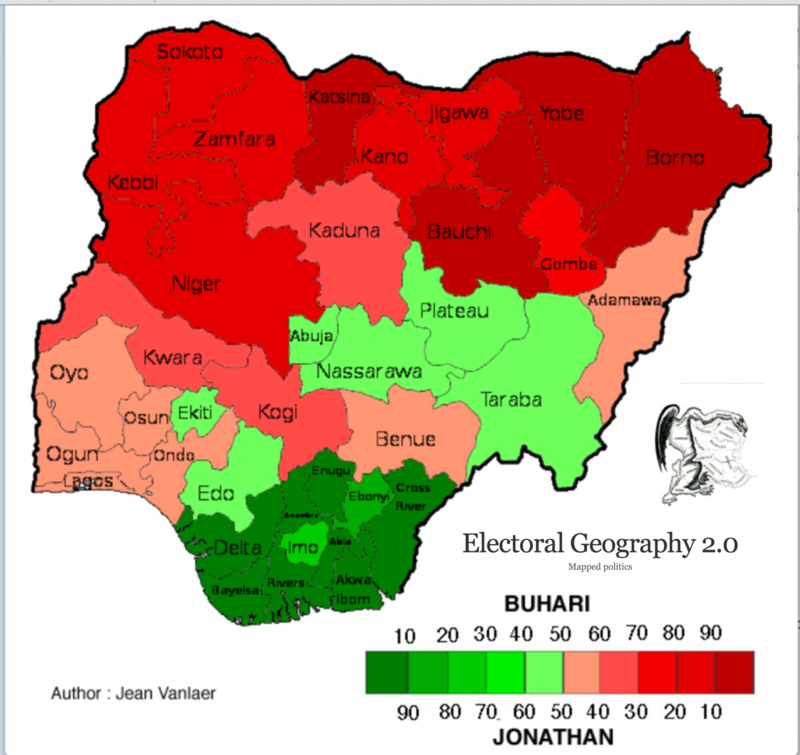 Such a “mixed” electoral map is a hopeful sign for Nigerian national unity. Nigeria’s regional political division has been so pronounced that a special election rule was created to ensure some measure of trans-regional support: a successful presidential candidate must gain at least 25 percent of the vote in at least two-thirds of the country’s 36 states. But the 2015 electoral map also shows the persistence of regional division. 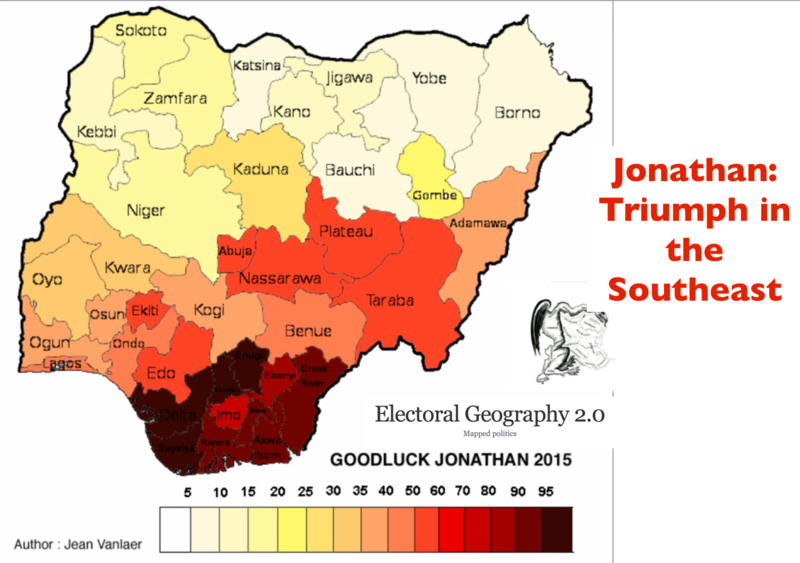 Although Buhari did quite well in many southern states, he failed miserably in the southeast. Over most of this densely populated and economically significant area, Buhari received less then 10 percent of the vote, as the electorate remained overwhelmingly committed to Jonathan. Intriguingly, the area that voted heavily for Jonathan in 2015 almost exactly matches the region that rebelled against Nigeria and declared itself to be the independent country of Biafra in the late 1960s, as can be seen in the next map. 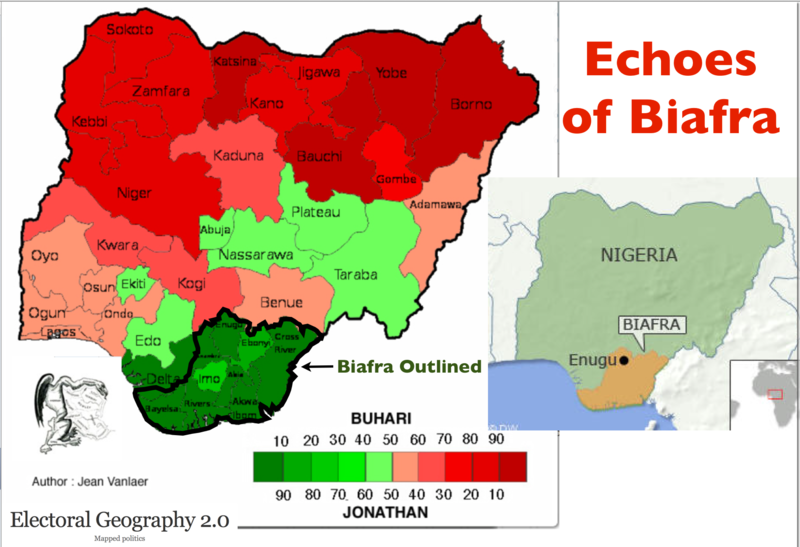 This area, demographically dominated by the heavily Christian Igbo people, thus remains politically distinctive from the rest of the country. Among some groups in the southeast, the desire for independence remains strong. Former militants in Nigeria’s Niger Delta say unrest may resume if the country’s new president ends the amnesty program and monthly payments that brought peace to the oil-producing region. Each month, former militants who used to spend their time bombing pipelines and kidnapping foreign oil workers in the Niger Delta get the equivalent of about $330 to convince them to occupy their time in other ways. They also get access to training programs intended to help them find other work. This arrangement started in 2009, but it was never supposed to last forever. New Nigerian President Muhammadu Buhari said so in his inauguration speech last week, announcing the program would end in December. Two days later, however, a senior Nigerian official announced that the new Nigerian government “is committed to continuing with a militant amnesty program in the Niger Delta in a bid to improve the security situation in the oil-producing region…” The country can ill-afford renewed fighting in this region, despite the expense of the program. 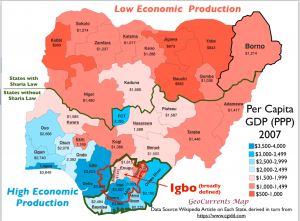 The real change in Nigeria’s electoral geography from the 2011 to the 2015 election is found in the southwest, another densely populated, economically significant region. In 2011, this area had supported Jonathan, but in 2015 it gave the majority of its votes to Buhari. But in neither election was the margin of victory pronounced. 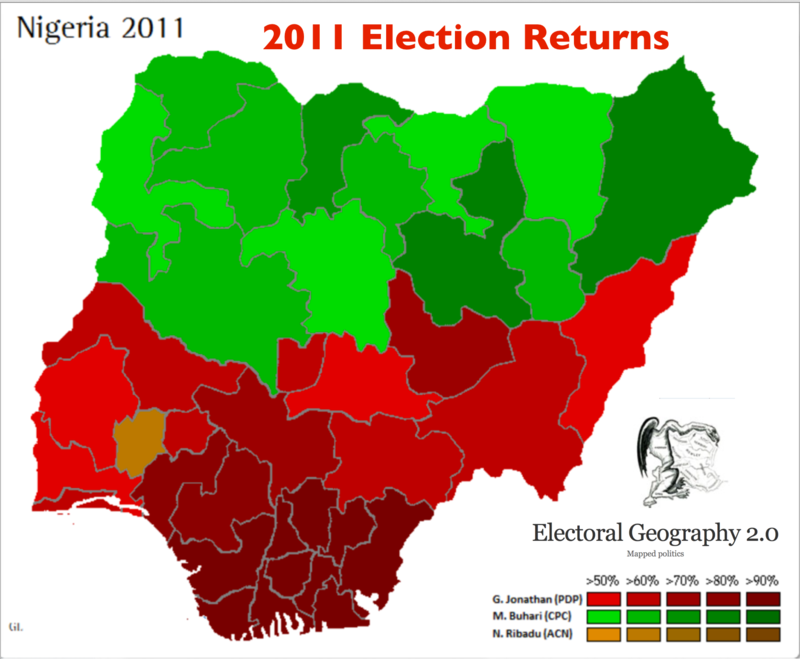 As a result, the southwest has apparently come to function as the vital “swing region” in Nigerian elections. 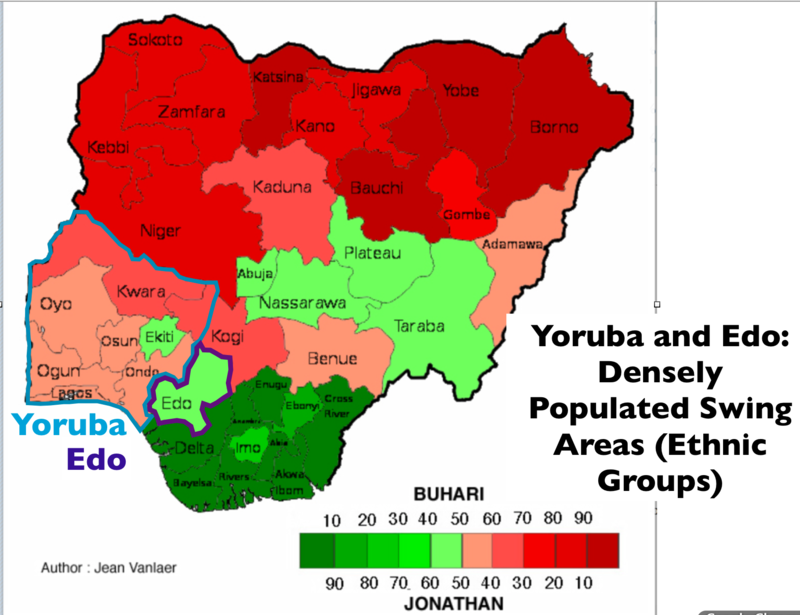 Most of the southwest is demographically dominated by members of the Yoruba ethnic group. Although Yorubaland is mostly Christian, it also contains quite a few Yoruba-speaking Muslims, as well as many practitioners of the indigenous Yoruba religion, a faith that has seen something of a revival in recent decades. 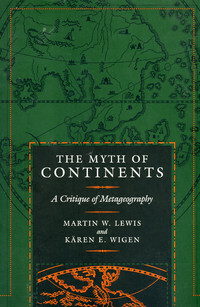 (Unfortunately, data on the actual religious make-up of the region is not easy to find.) 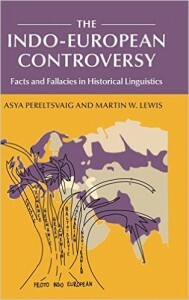 Although the Yoruba are mixed when it comes to religion, they do tend to have a strong sense of regional and ethnic identity – as well as a degree of suspicion of both the Igbo-dominated southeast and the Hausa-Fulani-Kanuri dominated north. 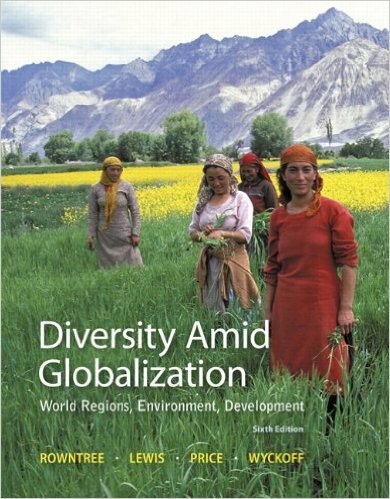 Wednesday’s post will examine Nigeria’s regional divisions more carefully, looking specifically at those who would like to divide the country into several new sovereign states.